New Holland Pier was a wonderful anachronism in the 1970s! The lower quadrant semaphore signals are Great Central Railway, the right-hand one "off" for a DMU to crossover into the opposite platform, and the swan-necked lights were probably gas originally. 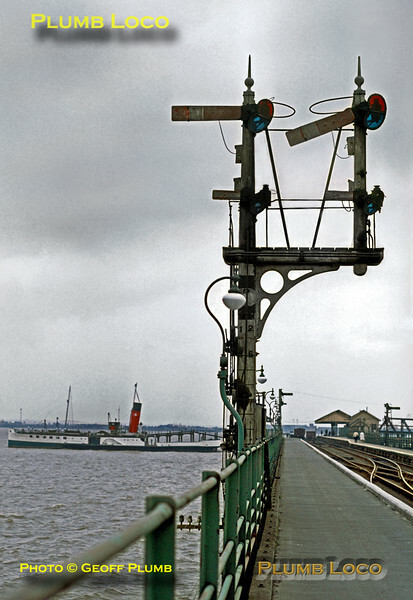 A wagon of coal stands at the buffer stops, waiting for its load to be transferred to one of the cross Humber paddle-steamers. PS "Tattershall Castle" is moored out of use at the end of the pier. All this came to an end with the opening of the Humber Bridge, when the service ceased. Tuesday 31st August 1971. Slide No. 7408.